Does Drinking Cold Water Cause Cold? Does drinking cold water cause cold symptoms? There are several old wise tales that tout that it does, but there is no scientific evidence proving so. It was once thought that drinking cold fluids would lower your body temperature enough to make you more susceptible to illness, but this is simply untrue. In fact, there are instances that consuming cold water can help with certain ailments. Colds are caused by viruses and nothing else. With that said, there are times you should avoid drinking cold water. Simply stated, drinking cold water does not cause colds. Airborne viruses, typically the rhinovirus, are the culprit. Unless the virus in on the rim of your glass or in the water, you will not catch a cold from drinking cold water. There are viruses all around us. The cold virus is spread when a person who is infected talks, coughs or sneezes. The individual releases droplets that hang in the air. These same droplets also land on objects such as our hands, utensils, door handles, phones and many other things. When you shake hands with someone infected or touch something contaminated and then touch your mouth, eyes or nose, you allow the virus to enter your system and you get a cold. Does Drinking Cold Water Cause Sore Throat? Does drinking cold water cause cold symptoms? No, but drinking cold fluids or eating cold food can cause a sore throat. Sometimes consuming cold food and drinks can cause you to suffer from congestion of the respiratory system mucus. The mucus provides a natural barrier against infections. When it shrinks because of the congestion, it allows bacteria and viruses to penetrate more easily and leads to throat infections. In the summer, you tend to drink more cold fluids because of the heat. When you constantly consume cold food and drinks, you open yourself up to a greater chance of a respiratory infection. Continuing to consume cold drinks delays recovery because you are extending the assault on your respiratory system. While drinking cold water provides a quick pick-me-up, it is only a temporary fix. As your body consumes the water and works to warm it, it actually burns energy instead of providing it. Instead of working as a stimulant, it can leave you overly tired if you drink too much. Many use cold compresses to treat inflammation on external parts of the body, such as a swollen hand or foot. However, internally cold temperatures are anti-inflammatory, causing retractions of blood vessels. Drinking too much cold water can cause abdominal pain and upset your stomach. It can even induce nausea or vomiting because your stomach constricts and it disrupts digestion. Does drinking cold water cause cold symptoms? No, but it can mess with your hydration. While you may think drinking cold water will ease your thirst, room temperature water is better for you. To make use of the water you consume, your body must heat it to your normal body temperature for it to enter your system. Drinking cold water delays the hydration process. As mentioned, digestion is greatly affected by drinking cold water. Drinking it quickly can lead to diarrhea. However, it will most likely cause constipation. The cold temperature interferes with digestion because it can cause intestines to constrict and food to solidify. When you eat ice cream too fast, you can get a “brain freeze” headache. The same thing can happen when you drink ice cold water too quickly. The throbbing and intense pain can travel to your head, up and down your spine, and throughout your torso. This can induce body aches, as well chills. When you drink cold water, the cold temperatures rush past your spinal cord and vagus nerve in your neck. Even though your body works quickly to warm the fluid, it still has time to affect areas of your body. The vagus nerve is instrumental in controlling your heart rate. The nerve can slow down the heart due to the quick change in temperature, thus slowing your heart rate. 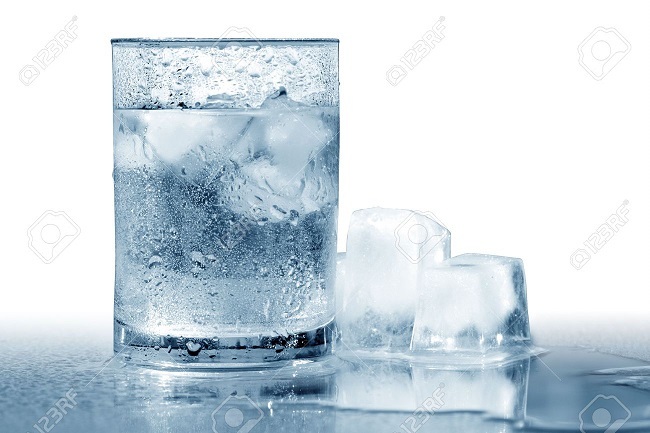 It is thought drinking cold water will cause your body to burn calories and increase your metabolism. However, any reaction of this sort is negated because the cold hardens the fat in your digestive system. This makes them harder to burn and leaves solid compounds behind.